Castelo de São Jorge (often just called Lisbon Castle) is one of Lisbon’s most popular tourist attractions. It sits high up on São Jorge hill, the highest hill in Lisbon, and is an iconic part of Lisbon’s skyline. At night, the castle is lit up and continues to be a part of Lisbon’s beautiful skyline. 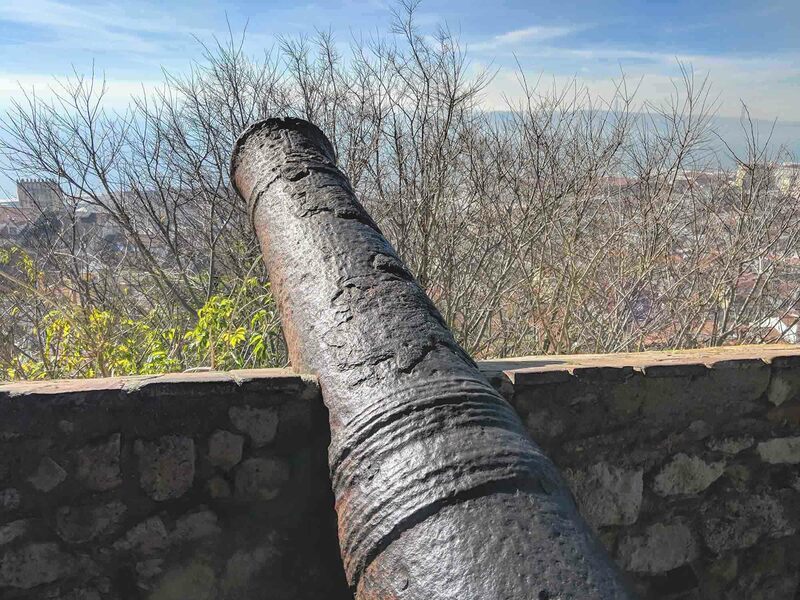 You’ll get some of the best views of Lisbon from São Jorge castle: you’ll be able to see right over Baixa (downtown Lisbon) and even across the River Tejo to the Cristo Rei statue in Almada. On a good day, you can also see a lot of the attractions in Baxia such as the Padrão dos Descobrimentos (Discoveries Monument). The views alone are one of the things that people love most about the castle. What people don’t love is the steep climb up to the castle and the queues of tourists, which are especially typical in months like July and August. You can avoid them somewhat by going early or late, but it’s hard to avoid the crowds completely. Is the castle worth visiting? The remains of the castle consist mainly of the outer walls, including 11 preserved towers, as well as the ruins of the former Royal Palace of the Alcáçova, an archaeological site, museum, and a camera obscura. Many visitors are disappointed that the castle and palace ruins consist mainly of the main walls and, apart from a few cisterns, there’s very little remaining of what life was like inside the castle. There are a couple of reasons for this. Firstly, for the majority of its existence, the castle wasn’t really a residential castle. It was designed to protect the elite (especially the king) during a siege and to house the military the rest of the time. Secondly, Lisbon castle is old. It dates back as far as the 11th Century and has been through at least one major earthquake, so it’s not surprising that there are only minimal remains. 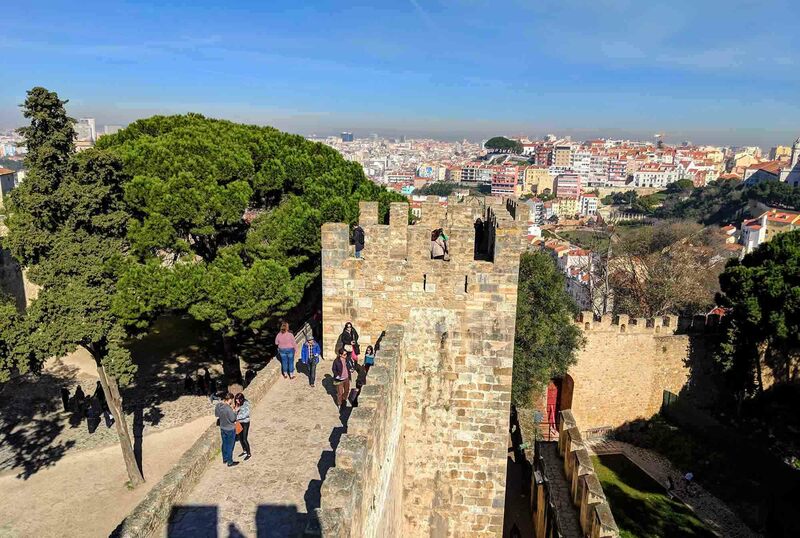 Most people, though, really enjoy their trip to Castelo de São Jorge. It’s a chance to see one of the most important historical attractions in Lisbon, somewhere that played a key role in Portugal’s history, and an opportunity to get some really good photos of Lisbon as well. There isn’t much information about Castelo de São Jorge inside the castle, and even the pamphlet is incredibly sparse with information. It’s still worth picking up the pamphlet for the map but, for actual information about Lisbon Castle and its history, it’s worth reading the history snippet below. Like most castles in Portugal, Castelo de São Jorge has gone through many evolutions during its existence. Here’s a quick list of the key moments. 2nd century BC – The first fortification is built on the hill (although there is evidence of settlement in the area before that). 5th century AD – The Visigoths build a small fortress on the hill. 11th century AD – The fortress is taken over by the Moors (along with a lot of the rest of Portugal). The stronghold is modified and strengthened. 1147 – King Afonso I frees Portugal from Moorish rule. During his reign (1109 – 1185), the castle was altered and transformed into a Royal Palace. 1910 – Castelo de São Jorge is classified as a national monument. 1938 – Castelo de São Jorge is completely restored following a major renovation project. You might be wondering who São Jorge was. He had both a castle and a hill named after him, so he must be a pretty important Portuguese person. Surprisingly, São Jorge wasn’t Portuguese. São Jorge is actually Saint George, the patron saint of England. The English crusader knights worked with King Alfonso and helped to free Portugal from Moorish rule. The knights told the Portuguese the story of Saint George and how he saved a virgin from a dragon, and this story became extremely popular amongst the Portuguese soldiers. It wasn’t until the late 14th Century, when King John I married the English princess Philippa of Lancaster, that the castle was dedicated to Saint George. 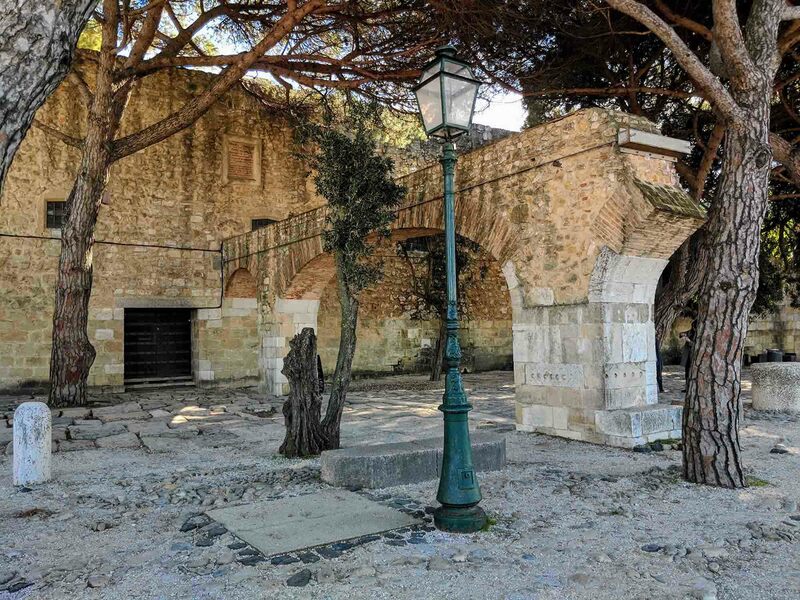 By then the story was popular in both countries and naming the castle after Saint George helped to cement the special ties between the two countries. 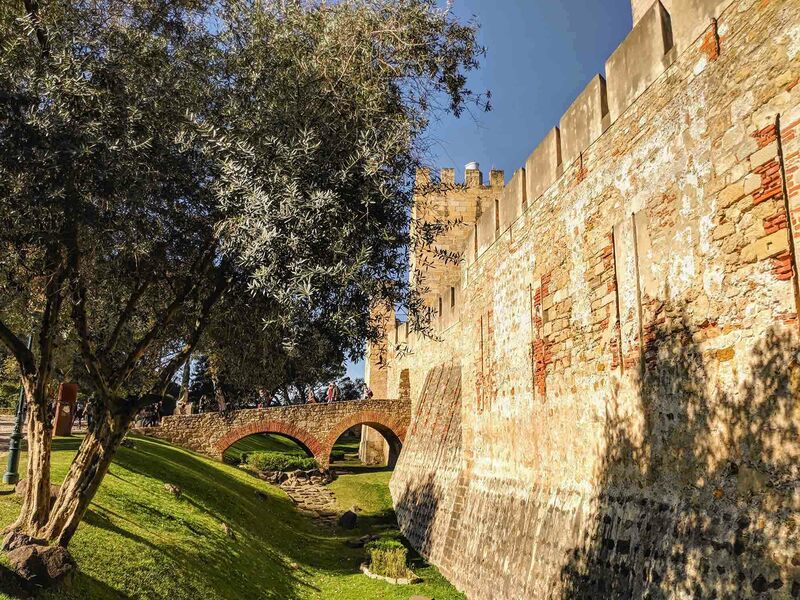 The following is a checklist of the things that you should look out for when you visit São Jorge castle. Castelo de São Jorge has fantastic views over Lisbon, particularly from the courtyard area directly after you go through the entrance. There are cannons all along the outer walls of the castle, and all of them are in great condition. There’s a bronze statue of Afonso I of Portugal (1109 – 1185) inside the courtyard just after you go through the entrance to Lisbon castle. Interesting fact: this statue is actually based on another statue. If you want to see the original, you’ll have to go to Guimarães Castle (where Alfonso I was born). The castle is the most exciting thing to see, of course. The external walls and the remaining 11 towers are in extremely good condition and give you a good idea of what the castle would have looked like back in the day. Inside the second courtyard, you’ll find a small doorway called the “Door of Treason.” This door allowed messengers to enter and exit the castle in secret. At the entrance of the museum, you’ll find a reproduction of a 16th Century drawing of the palace, and this will give you an idea of what it looked like before the earthquake. The Torre de Ulisses (Tower of Ulysses) inside the castle contains a periscope which provides 360-degree real-time views of Lisbon. The museum at the castle hosts a permanent exhibition which showcases objects found at the archeological site. The museum covers the entire history of the castle but focuses especially on the Moorish period. Along with the views, the peacocks are often many people’s fondest memories of Castelo de São Jorge. You should give yourself 1-2 hours to see Castelo de São Jorge, and maybe a bit longer if you really want to see everything. The castle tends to get busiest between mid-morning and mid-afternoon, and it’s busier on weekends than it is during the week. Mid-day to mid-afternoon will also be the hottest time of the day to visit and, since a lot of the castle is very exposed, it makes more sense to visit earlier or later. 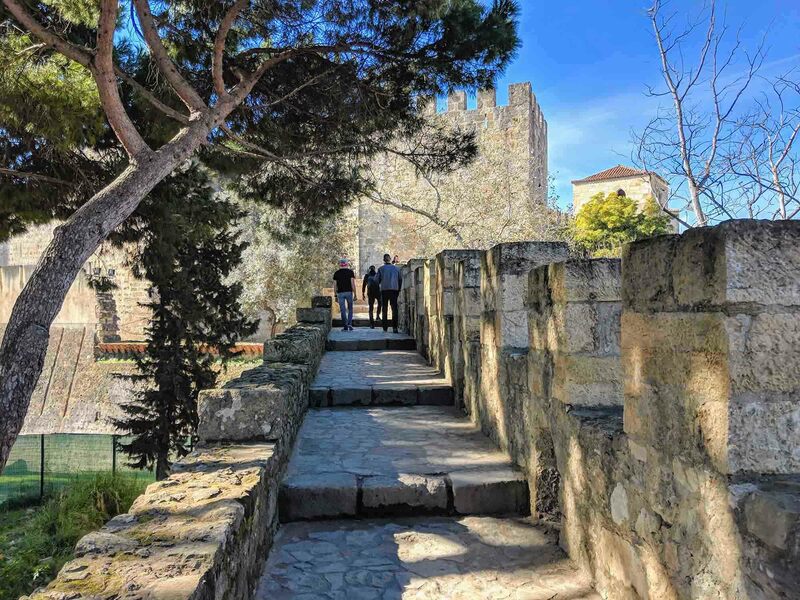 There are a few ways to get to Castelo de São Jorge. Walk: You can easily walk to Castelo de São Jorge from most parts of Central Lisbon. The hill is steep, but the walking time isn’t too long. There are also elevators and escalators along the way. Tram: Tram 28 and tram 12 go near to the castle. You will still have to walk up a steep hill, but it’ll take you most of the way. Bus: Bus #737 will take you from Praça da Figueira to the castle entrance. Taxi or Uber: A taxi or Uber will take you much closer to the castle entrance, and it can even work out cheaper if there are several of you in the taxi. Lisbon residents can enter the castle for free, and residents of the rest of Portugal can enter the castle for free on Sundays and holidays between 9am and 2pm. You can’t buy normal-priced tickets online, but you can buy a ticket bundle that includes access to the castle from Blue Ticket. This ticket allows you to skip the queue, and also includes access to the Fado Museum, Aljube Museum, and Museu de Lisboa. Last admission is 30 minutes before closing time. The castle is closed on January 1st, May 1st, and December 25th. The Camera Obscura is open from 10 am until 5:20 pm. There are good facilities at Castelo de São Jorge. Food & Drink: There’s a restaurant (Casa do Leão) and several cafés inside the castle. Shade: The castle itself is quite exposed, but the main courtyard inside the entrance is quite shady. 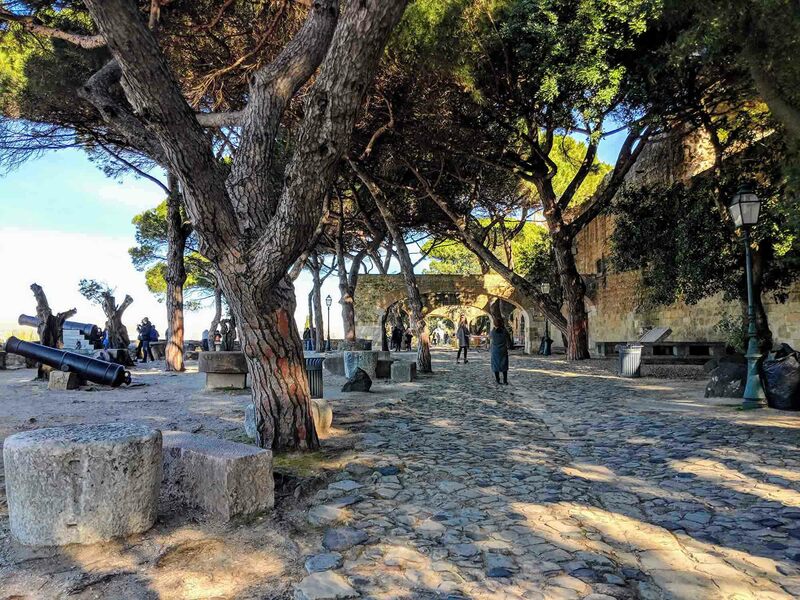 Getting to and around Castelo de São Jorge will be quite difficult if you’re disabled or have small children. There’s quite a lot of climbing involved, and the steps themselves are very high. Thank you for this great info on the castle. We will be there in late June and staying in the castle area. Looking forward to walking to and touring the castle. You’re very welcome, Gregg! Hope you have a great time in Lisbon.